Emergency personnel test handheld chemical detectors that use the BSP3 polymer to determine if nerve agents are in the air. Sensors with a BSP3 coating can be used to monitor air quality in subways and buildings, and also to protect first responders at terrorist or chemical incidents. 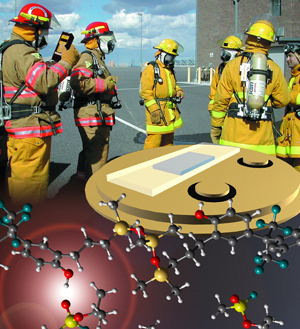 RICHLAND, Wash. — A unique polymer that allows sensors to detect nerve agents and other toxic industrial chemicals in the air is now available to companies developing chemical detectors for emergency personnel, indoor air quality monitoring and other uses. Researchers can now access a hybrid organic-inorganic polymer known as BSP3 through Seacoast Science, Inc., thanks to a license agreement between Seacoast and Battelle, which operates the Department of Energy’s Pacific Northwest National Laboratory. PNNL developed and patented the polymer and then partnered with Seacoast as part of the lab’s mission to transfer technology to the marketplace. Seacoast has added BSP3 to its catalog of more than 100 polymers, which researchers use to cover the surface of a sensor. Polymer coatings collect and concentrate the vapor molecules of airborne chemicals. Absorbing the vapor molecules creates changes in the polymer’s properties, which results in sensor signal changes. Multiple sensors, each covered with a different polymer especially sensitive to a specific class of compounds, are used together as a sensor array. The collective response of a sensor array provides a “fingerprint,” or characteristic pattern, that helps researchers recognize and distinguish one chemical compound from another. Sensor arrays with polymer coatings are often called “electronic noses” because they recognize response patterns from multiple sensors, just as mammalian noses recognize response patterns from several olfactory receptors. BSP3 has a strong ability to absorb toxic organophosphorous compounds like nerve agents and pesticides. Using BSP3 in sensor arrays improves sensor abilities to distinguish one compound from another. Sensors with a BSP3 coating can be used to monitor air quality in subways and buildings, and also to protect first responders at terrorist or chemical incidents. Seacoast also plans to use BSP3 to improve its own product line. Those efforts include exploring how BSP3 may be used to detect explosives by combining the polymer with the company’s current sensor platforms. Seacoast will add BSP3 to the company’s proprietary preconcentration system, which allows users to detect chemicals at very low concentrations, and its SeaPORT gas chromatography system, which uses a sensor array to separate chemical mixtures and identify component chemicals. The company also wants to improve the ability of its own sensors to detect nerve agents and basic toxic industrial chemicals with BSP3. PNNL Chemist Jay Grate developed the BSP3 polymer, which received an R&D 100 Award in 2004 and holds U.S. Patent No. 6,015,869. It was created with funding from the National Nuclear Security Administration. The BSP3 license is one of more than 200 active licenses at PNNL. Numerous technologies developed at PNNL have been the basis for start-up companies and new products. Seacoast Science, Inc., is a Carlsbad, Calif.-based corporation that specializes in the development of chemical microsensor technology. Its primary focus is the development of specialty coatings, gas sensors and gas chromatographs for a variety of niche markets such as leak detection, military chemical detection, homeland security, air quality monitoring and emission gas detection. Seacoast's SeaPORT miniature gas chromatography was recently named by Connect as one of 2008's Most Innovative New Products and its development is considered to be an Army SBIR Success Story.